The Mansion Geranium Garden: Bliss McIntosh tells us how to raise Geraniums. This has been a hard winter for the Mansion residents, it is difficult to ever take a walk, and sometimes you can feel the arctic wind creeping around the windows, even as the giant Mansion furnace rumbles and roars. Inside the Great Room and in the hallways and rooms, it is snug and inviting. I felt it was important for the residents to have living things to nurture and watch grow and take care of. I got this idea for a Geranium garden that they could plant and care for, and each one could pick a plant or flower to put their name on, and in the spring or summer, they might take a flower into their room or plant some Geraniums in the big Mansion garden just outside the back porch. 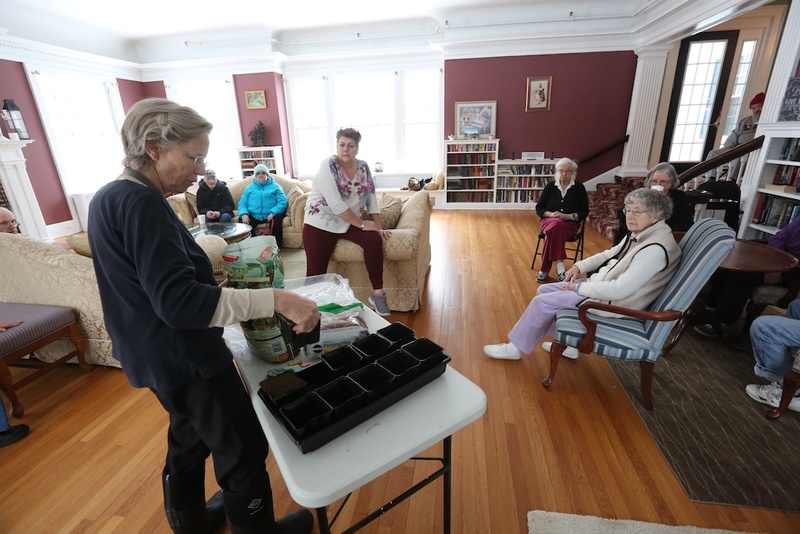 They were excited about the idea, about a dozen residents came to see Bliss McIntosh, a gardener, botanist and community activist in our town, she oversees the Cambridge Community Garden, a beautiful garden cared for by the town as a whole, a beautiful act of community. Bliss is one of those people who makes community live, and she graciously agreed to come over to the Mansion and talk about Geraniums and how to help them grow. I bought the supplies – the special soil, the root powder, the small containers and the trays. Bliss brought some Geranium cuttings. She explained that Geraniums are hardy flowers and can grow well indoors, kept away from the sun and radiators and not drowned by too much water. Barb, who cares for the two Mansion parakeets diligently and lovingly, agreed to care for the Geranium cuttings. She will be all over it. Below, a short video of Bliss talking to the Mansion residents. Everyone said they would want to adopt a flower and keep track of it as they grow. I’ve learned that the residents are almost desperate to care for living things – cats, dogs, birds, and now flowers. They didn’t take their eyes off of Bliss, she walked all of us through the process. We put soil in the pots and planted ten Geranium seedlings. Bliss and I are coming back to plant another ten. We put them on the opposite wall near the front door, there is shade there and no radiators close by. She showed us how much water to put in the tray and how to gauge the plant’s health. I will be responsible for checking on the plants two or three times a week, and will help Barb out. I loved the attention and excitement in the room, and I will be following the story of these cuttings. I think much of what we do for the Mansion is bringing life, light and color to the lives here. I’ve seen how much the parakeets mean to them, and I imagine they will pay close attention to these plants and watch them come to life and grow. Sometimes I think the absence of diverse life is the greatest challenge of assisted care. Many of the residents feel removed from life, and your cards and letters and photos and decorations and gifts have brought life into their lives. My job is keep it going. Living things are a metaphor for all of us, I think the Geranium Garden will bring much life into this warm place. I thank the Army of Good for their support of this project. Next event will be a Valentine’s Day lunch on February 14, catered by the Round House Cafe: lasagna, cookies and cake. A Valentine’s Day party will be held just after lunch in the Great Room. I am exploring some special food for the Chinese New Year as well. Winnie, Jean, Ellen, Mary, Gerry, Sylvie, Jane, Diane, Alice, Jean G., Madeline, Joan, Alan, John K., Helen, Bob, Alanna, Barb, Peggie, Dottie, Tim, Debbie, Art, Guerda, Brenda, David, Kenneth, Ruth, Wayne. If you wish to donate to the Mansion or refugee work, you can do so by sending a contribution to my post office box, Jon Katz, P.O. Box 205, Cambridge, N.Y., 12816, or via Paypal, jon@bedlamfarm.com. Thank you, thank you. Truly, you have touched and lifted the hearts of so many people. A Geranium tray seems like a small thing, and it is simple and inexpensive. But to the residents, it is a very big thing, they are already studying the plants to see which one they wish to adopt.